Regardless of whether you are managing a team of 5 or 500, StaffSavvy has the tools to create & manage your team's shifts easily. Each shift has custom start and finish times; allowing you to infinitely tweak your rotas as needed. Because we know your staff wages, we can accurately estimate your workforce cost for any given day. Using the timeline view, you can select multiple shifts and drag their start and finish times as needed; the cost estimate for your day is instantly updated at the top of the page. Meeting budgets has never been easier. And when you're done, your staff are emailed automatically with their new shift times. Always be on budget with StaffSavvy; our simple but intelligent budget system allows you to ensure every shift comes in on budget. The system can be set to use straight-forward fixed staff costs or a percentage of sales for that day. When managing your shifts, you can just drag your shifts around to hit your desired budget. Allowing staff to swap shifts has always come with some pain. Scruffy sheets of paper with crossed off names and indistinguishable nicknames or haphazard Facebook groups which are impossible to track. No more. StaffSavvy smartly manages all staff cover requests, exchanges and cancellations. Only correctly skilled staff can cover them, minimum contracted hours are maintained, limits are placed on how many shifts they can request cover from without working and your staff are constantly reminded that it's their responsibility to find cover. With a 10-year proven track record; our approach has been to work time and again in ensuring you always have the right staff in the right place at the right time. And if you don't, it's automatically logged and available for you to review. Anywhere, anytime. Forget locking yourself away for several days at a time to create the monster of all rotas. Our intelligent rota system understands all of your workforce's availability. It know their contracts, their holiday, the hours they can't work, the training they're booked on, their contracted hours and the other shifts they've already committed to. Using our rapid template tool, you simply plot out the skills you need for each day. You can also name certain individuals if you need to. You can then insist one staff member works the whole shift or allow StaffSavvy to split the shift up to maximise your staff availability. This is perfect for long opening hours; simply state you need X bar staff from 7am to 2am and StaffSavvy will fill that need with multiple people working shorter shifts. Create rotas for one outlet at a time or work on multiple outlets/departments are once. Rota for any period of time from one day to an entire year. All the time based on when your staff can actually work. No headaches. Done in minutes not hours. Adding additional shifts is easy; there is always someone you can rely on to work extra. Reducing the number of staff working can be trickier and fraught with personal grievances. StaffSavvy makes this easy. By setting up a request to reduce shifts, staff are shown shifts they can give up. They can simply elect not to work a shift and their shift is cancelled. If no one chooses not to work then StaffSavvy can automatically pick eligible staff and cancel their shifts for you. They simply receive an email or SMS^ to inform them that the decision has been made automatically. You can place some influencing rules on this to ensure you have the best team for the shift. By using the automatic option, there are no repercussions from the selected staff. It's nothing personal; the site automatically selected them not to work that day. Add single shifts with a click. Autofill staff names to quickly build up shifts for a day. Duplicate any existing day & repeat it. Got the perfect Friday setup? Repeat it every Friday for as long as you need. Want your staff to have their choice of shifts? Not a problem; with extra shifts, staff with the same skills can pick and choose them as needed. We also have tools to make it fair for your whole team. Print-ready version of your shifts and timelines are ready to go. 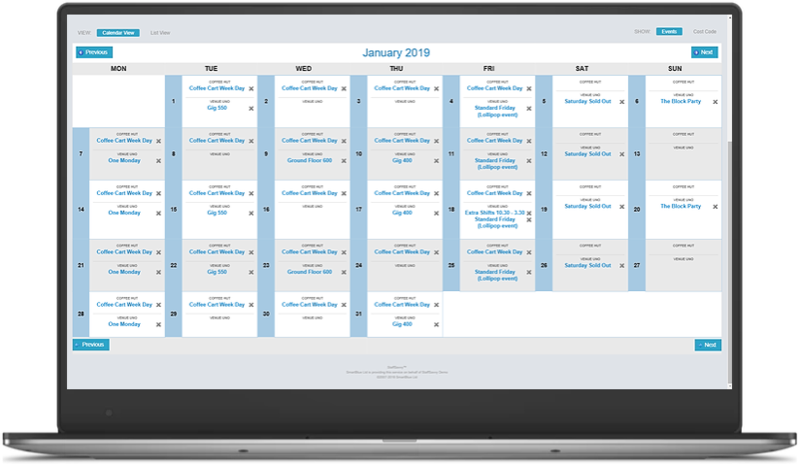 Manage your shifts in daily grids, daily timelines or weekly views. Simply use the best view for you. Sync your shifts directly to your phone calendar. All updates pushed through to your phone automatically. Allow staff to swap shifts without worry; StaffSavvy only lets staff with the same skill to swap shifts. It allows staff to manage their own schedules while ensuring you have the team you need. You can always block this too. Need more staff for a day? Just add Extra shifts and your staff can take them on the site. Need to get the word out? Email or SMS^ to all staff not working on a day to ask for their help. Have staff on complicated contracts or work visas? StaffSavvy allows you to set minimum and maximum hours per week, month or year and then obeys them throughout the site. Never breach working rules again.